The Effect of Low-Dose IL-2 in Clinical Facial Transplantation: Molecular and Immunological Response. Regulatory T cells (Tregs) play a critical role in immune tolerance and low-dose recombinant IL-2 administration has been reported to expand Tregs in vivo. Although multiple trials reported clinical efficacies of IL-2 in chronic graft-versus-host disease, its effect in vascularized composite allograft (VCA) transplantation has not been examined. We report the first case of a facial transplant recipient who received IL-2 for in vivo Treg expansion and calcineurin inhibitor minimization. A 57 year-old female received a full-face allograft. At 56 months post-transplant, the patient was converted from tacrolimus to sirolimus and then initiated on daily subcutaneous IL-2 protocol. IL-2 was started at 1.5×106 IU/m2 and titrated down to 0.5×106 IU/m2. The effect of IL-2 was monitored using i) flow cytometric analysis of peripheral blood for Treg, Th1, Th2, Th17, natural killer (NK) and B cell subsets, ii) histological and immunohistochemical analyses as well as iii) gene expression profiles of allograft (n=8) and native skin (n=2) biopsies by Nanostring platform that examines the expression of 730 genes. 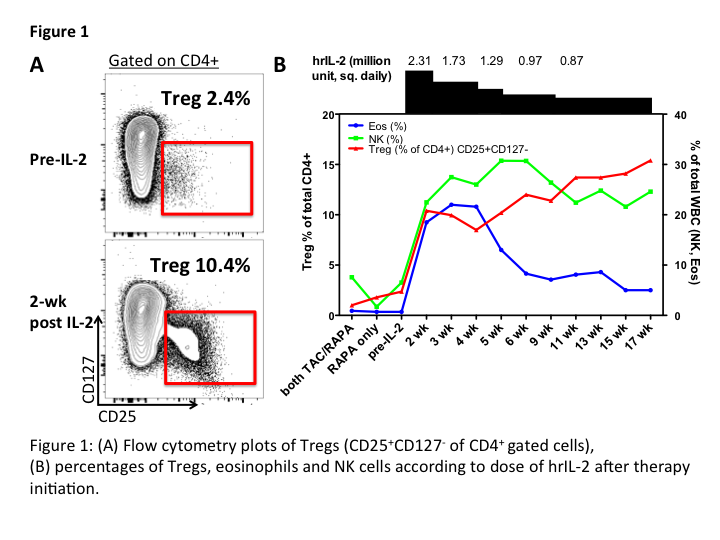 IL-2 administration significantly expanded Tregs (CD4+CD25+CD127–), NK cells (CD3–CD19–CD56+) and eosinophils, while decreased B cells in peripheral blood (Figure 1). We observed increased Th1 and Th17. Immunohistochemical staining using CD3, CD8 and Foxp3 showed increased infiltration of Foxp3+ cells in both allograft and native skin following IL-2 administration. IL-2 induced a distinct molecular signature in allograft, including reduced cytotoxicity associated genes (e.g. Granzyme B and perforin). Comparison of native skin vs. allograft while on IL-2 demonstrated a distinct cytokine profile, indicating the allograft-specific effects of IL-2 administration. IL-2 administration expands Tregs while reducing B cells in VCA recipients on triple immunosuppression. Our findings provide important insights on its allograft-specific and systemic immunoregulatory effects. CITATION INFORMATION: Murakami N, Win T, Borges T, Lian C, Murphy G, Bueno E, Clark R, Strom T, Pomahac B, Riella L. The Effect of Low-Dose IL-2 in Clinical Facial Transplantation: Molecular and Immunological Response. Am J Transplant. 2017;17 (suppl 3). Murakami N, Win T, Borges T, Lian C, Murphy G, Bueno E, Clark R, Strom T, Pomahac B, Riella L. The Effect of Low-Dose IL-2 in Clinical Facial Transplantation: Molecular and Immunological Response. [abstract]. Am J Transplant. 2017; 17 (suppl 3). https://atcmeetingabstracts.com/abstract/the-effect-of-low-dose-il-2-in-clinical-facial-transplantation-molecular-and-immunological-response/. Accessed April 19, 2019.